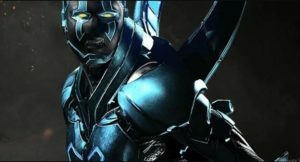 This page contains a character guide for Blue Beetle in Injustice 2. Here you’ll find movelists, combos, juggles and strategy guides and recommended gear for the Hero character. For more Injustice 2 content, head over to our Injustice 2 top page. Jaime Reyes sought Batman’s help in learning to use the Scarab, an alien weapon of mass destruction bonded to his spine. Although the Scarab could pose a deadly threat to the entire planet, kindhearted Jaime is determined to protect people, wary of the corrupting influence of great power he witnessed under the Regime. Can toggle Power Blades On and Off. Shield Slam changes to Mandible Strike when Power Blades are active. Gains Power Blades for all Punching Attacks. Disables (Air) Energy Cannon, Energy Cannon and Crawling Burst when Power Blades are active. Can toggle Power Blades Off. Meter Burn R2 (must press R2 at the beginning of Mandible Strike). Below are combo and juggle inputs for Blue Beetle , including corner strategies and restarts. My spouse and I went over here by a different page and thought I should check things out. I like what I see so now i’m following you. Look forward to going over your web page for a second time.